Lives of the Spiders: A Ferocity Even From the Remove of the Kitchen Window. Yesterday my dad woke me up, calling to me to say there was a hawk in the backyard. The hawk had a pigeon in its talons. A few feet away from the bird feeder, on top of fresh snow, the hawk plucked the feathers from the pigeon, and the hawk's curved beak probed and pulled strips of flesh from the carcass of the pigeon. It was beautiful and hypnotic to watch: a ferocity we could sense even from the remove of the kitchen window. 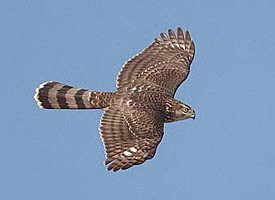 The hawk looked like she was dressed for a military action, black bands on her slate grey tail, reddish bars, the color of a female robin's breast, across her chest and belly, and the startling white fluff of her rump. The pull, the tug, the task of plucking a meal. She (later an expert looked at the photos we took and said that a Cooper's Hawk who was large enough to catch a pigeon was surely a female) she was such a harsh and lovely representative of nature "red in tooth and claw." I wonder if I'd feel so kindly toward her if she'd caught a cardinal, or a woodpecker, some bird I see as a "real" bird and not some urban trash. Pigeons, after all, have their own flocking beauty, silver and startling against a grey winter sky. This makes twice in the past couple of months that I've seen a Cooper's Hawk, that baroness, crouched over her kill near a birdfeeder. The first time was in Chicago--Darren and I leaving for breakfast disturbed a hawk at her own meal in the courtyard. She grabbed it and fled. Circle of soft down whirling a bit in the wind over larger feathers, speckled red droplets in the snow. This hawk had killed a pigeon in suburban Michigan. The backyard feeders were silent and deserted the rest of the day, not even the plump squirrels nuzzled the ground below for the peanuts Dad puts out for them--somehow word got out that this was a crime scene. "Somehow" being the feathered circle, the red dots, mournful in the snow. But I had not thought the little brains of feeder birds capable of making these deductions and associations. Does every bird have a bird who would make of it a meal?